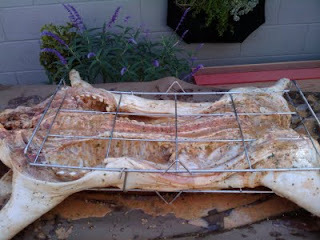 Hungry Kat: This Little Piggie went to a Whole Pig Roast! 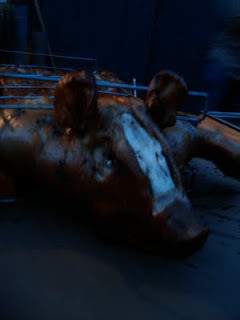 This Little Piggie went to a Whole Pig Roast! WARNING! Explicit photos! Do not scroll down if seeing a whole uncooked butterflied pig will disturb you. 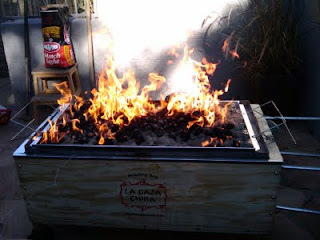 About six weeks ago, my friend, J., mentioned that he ordered a pig roasting box and that he and his wife, R., were going to host a whole pig roast party. Of course, I immediately/shamelessly invited myself; after all, there is a whole pig at stake! 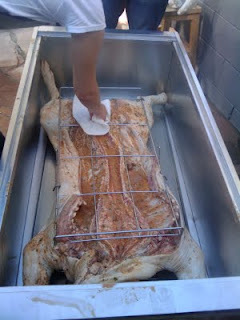 True to Hungry Kat fashion, I couldn't just arrive and eat so I volunteered to go early to help prep the pig. Prepping and cooking the pig was really fun even though we were sweatin' in 90 degree heat in October (ah, isn't Los Angeles great?). All that effort just made eating the pig that much more satisfying. 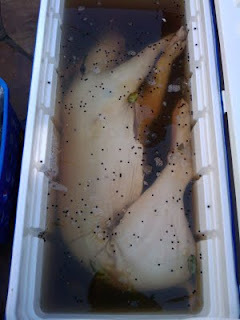 J. brined the pig for two days with salt, peppercorns and cumin seeds and kept it in an ice bath. 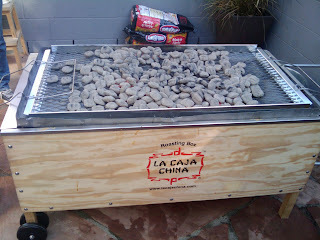 The pig roasting box came from La Caja China. Very handy instructions on the side of the box but J. did a lot of research beforehand too. 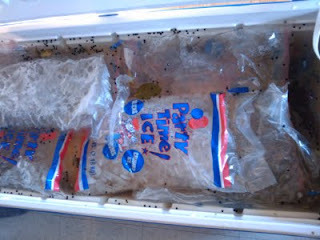 We took out all the ice and got ready to lift the pig out of the ice bath so we could put garlic and the seasoning rub on it before we roasted it. Gripping and lifting the 70+ lbs pig onto the table was not easy and there were three of us lifting it. 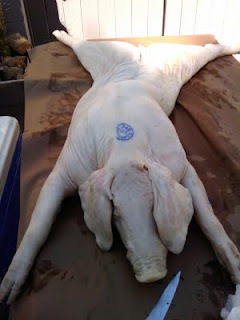 J. ordered the pig from Alexander's Prime Meats in San Gabriel and they cleaned and butterflied it beautifully. J. said they're a really cool old-school butcher shop; I can't wait to go. 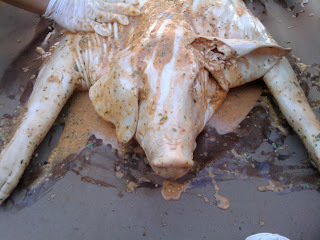 We wiped the whole pig dry with paper towels. Then we used knives and cut small openings all over the skin, from rump to shoulder, and stuck whole cloves of garlic into the openings. We used a lot of garlic. Okay, I do have my limits (I did grow up reading Charlotte's Web). 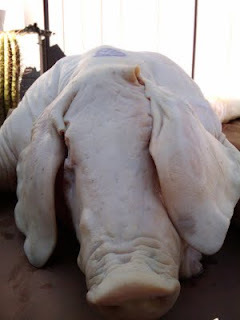 As I was drying the pig's face, I freaked out a little bit when I lifted the ears and saw the blue eyes. I quickly hid them again with the ears. J. and R. are amazing. They made the seasoning rub with their homemade pork bone broth, citrus and different kinds of salts and herbs. We rubbed it all over the pig. 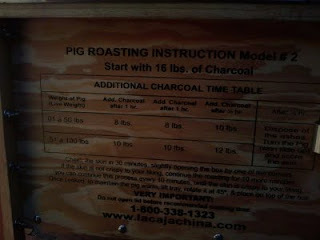 We strapped the pig onto the grill which came with the pig roasting box. The grill goes on top of a drip pan that's laid inside the box. I thought the tail would be longer and curled. When I was a little girl, it always tickled my imagination and made me salivate when I read Little House in the Big Woods and got to the part where Pa butchers a pig and gives little Laura the crispy, curly pig tail to eat. I also loved the part where Laura and her sister blows up the pig's bladder to make a ball to play with and then helps their mother preserve the meat for the Winter. We've definitely come a long way in terms of cooking and entertainment since the 1860s. Pig in a box. It's almost ready for roasting! This is the lid that covers the roasting box. 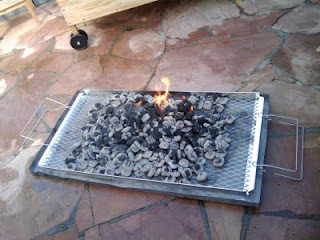 A rack sits on top of the lid to hold the charcoal and ashes. J. lit charcoal and burned it until it all turned white before putting the lid on. Ahhhhh. The pig begins its 4-hour roasting journey. J. added more charcoal every hour for three hours. It was HOT; we were all sweating but J. was sweating the most since he had the hard job of adding and moving the charcoal around. He's our hero. 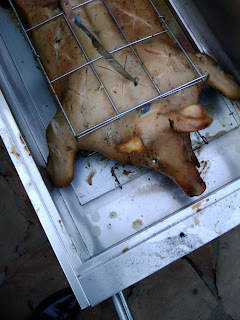 The pig's internal temperature finally reached 145 degrees which meant it was very close to being done roasting. 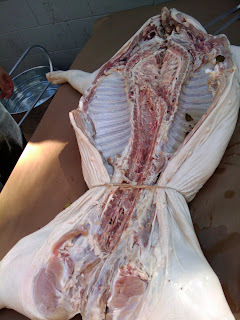 This was when we have to flip the pig to crisp the skin. This was not easy since it was heavy and hot but J. and his friend managed perfectly. Oooh, this was fun. 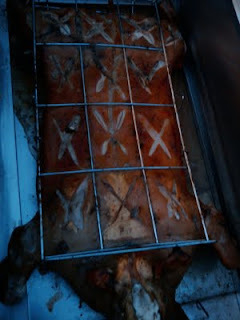 I got to score the skin (X marks the spot) all over the pig before we put the charcoal back on top to roast it for 30 more minutes to crisp the skin. 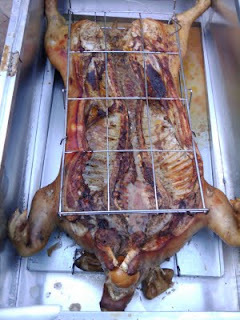 Whole Pig Roast - Done! Darn, I should have played tic-tac-toe! 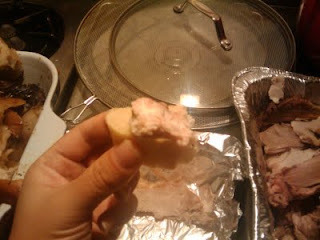 I stuck an apple into its mouth at the beginning of roasting. The apple went from red to yellow and wasn't really tasty. I should have had a second apple on hand just for presentation. Isn't that beautiful? 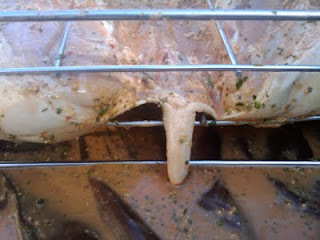 That's the rump/back trotter. Funny that the trotter was curled; it's probably because it was tight in the roasting box and the trotter got pushed upward against the side of the box. OMG! The meat was delicious and super juicy! 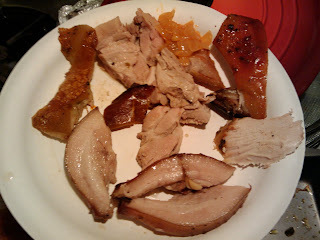 I tried pieces from all parts of the pig: belly, jowl (very fat), rib, rump, loin, cheeks and snout. The garlic and rub gave the meat a lot of flavors and all the pieces were good but the pork belly was absolutely melt-in-your-mouth heavenly. The snout was surprisingly meaty and it was a nice juicy chew. Too bad I missed out on the tongue; I heard it was delicious. Some of the skin didn't crisp so I tried pan-frying it - my feeble attempt at chicarrones but it didn't really work because I didn't use a lot of oil to deep-fry it. 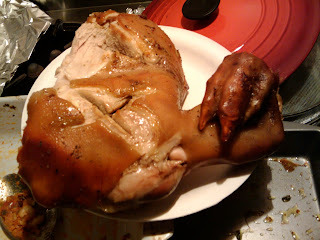 Still, the skin was good because it had an an even layer of fat that was bursting with rich buttery meat flavors. Oh, actually, one of the best parts was the pig's brain. It was sooooo good. J. 's friend cracked open the skull and we spooned out the brains. 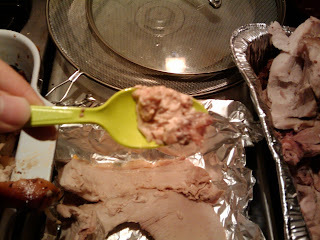 It was very rich and I think the best way to describe it is that it tasted like chicken liver pate or beef bone marrow. There was some leftover baguette so I spread the last pig brains on it - ah, another match made in heaven. This was one of the most fun and memorable cooking and eating adventures of I've ever had. It's great to cook and eat with others who are also passionate about cooking and food and experimentation. Thank you to J. and R. for having me and for an amazing time. I can't wait until they decide to repeat this craziness and roast a whole lamb or the "de-constructed turducken" we talked about. Okay, time to head to the gym...gotta pay when you totally pig out on pork! OK I managed until you mentioned the brains. Nyuch. Oh, Rob...I need to take you out to eat the next time you're back in town. But seriously, the brains were delicious. Kat--thanks for being a key member of the pig prep team! I'm already excited about the next beast. That's "Alexanders' Prime Meats" -- Choice would be a bit inferior. @Joseph - Ah, thanks for the heads up! :) Weirdly, the Goog came up with Choice first. so cute! and then.. so tasty! haha! wow thanks for the pictures! looks delicious. Too bad I just started dating a guy who can't eat pork for religious reasons. The Best Roast Chicken I've Ever Tasted! Health Dept - Wake Up!